IS FINESS RIGHT FOR ME? There you are, mid squat set, maybe even using dumbbells or a barbell to increase the difficulty. The adrenaline is rushing, sweat is pouring down your face, and you’re feeling pretty damn strong. And then… OH MY GOD. DID I JUST PEE A LITTLE!? Peeing when you work out is uncomfortable, embarrassing, and annoying. But you’re not alone. Upwards of 15 million women experience stress incontinence (the technical name for peeing when stress is put on your bladder – also known as SUI for short.) Because of the sensitive, embarrassing nature of the issue, it is often a subject that goes undiscussed, in spite of the fact that so many women are being affected by it. Well, no longer. We’re here to bring the subject into the blaring light of day. There are in fact multiple ways that bladder leaks can become an issue for women, including getting older, pregnancy, child birth, weight gain, and so on. “With stress incontinence, the sphincter pelvic muscles (which include tendons, and ligaments), that support the bladder and urethra, are weakened,” pelvic floor dysfunction specialist Gail O’Neill, P.T. says. 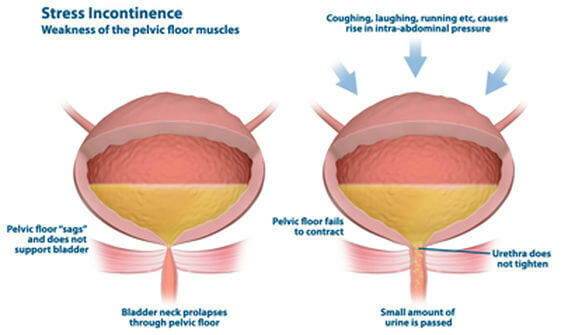 “The sphincter is not able to prevent urine from flowing when pressure is placed on the abdomen, such as when you cough, laugh, lift something heavy, or during certain forms of exercise such as running and CrossFit.” Once the urethra loses its muscle tone, most anything that puts pressure on bladder and pelvic floor can cause leaks, including exercise, jumping, running, and many other every day activities. I know, I know, not great news. Not one wants a dysfunctional pee pipe. But there’s hope! There are a few practices that may help decrease the mid-workout bladder leaks you’re experiencing in both severity and frequency. 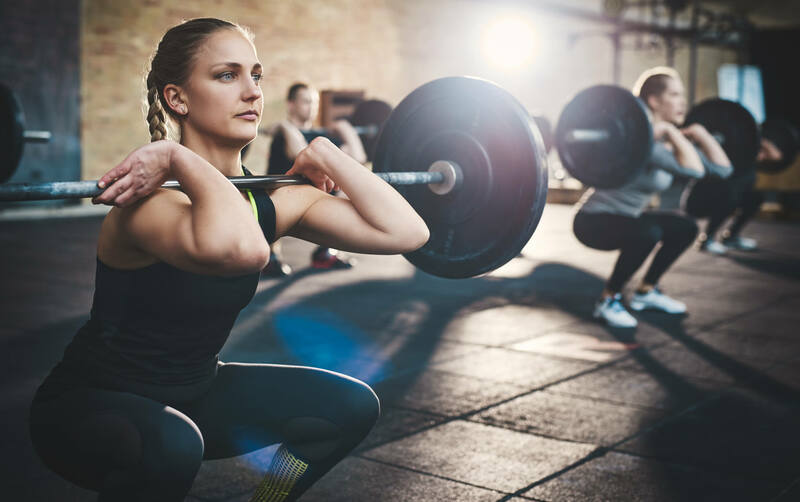 While there are no sure fire ways to get rid of them completely, using these techniques can definitely help your workouts be less, shall we say, “damp”, in the future. Kegals – The best place to start is to strengthen those pelvic floor muscles we mentioned previously. While doing your kegels may not solve the problem fully (there are other core muscles involved in the overall picture that comprises continence), strengthening those muscles are an important factor in improving the issue. To do a kegal correctly and activate the right muscles, simply clench the same way you would if you needed to pee really badly and needed to keep the urine from coming out. Mimic that contraction, hold it for two to five seconds, and then repeat the action 10 to 15 times. Keep adding additional reps to the set every day or two. Weight Loss – I know, this sounds like a catch-22. You’re experiencing leaks when you work out, but you need to work out to lose weight. Well the good news is, the workouts (even the leaky ones) will pay off, because losing 20-30 pounds can make a significant improvement in the occurrences of SUI. Try not to sit for long periods of time. When you sit (and especially if you have bad posture), it can weaken the muscles in your pelvic floor. So if possible, try to take multiple breaks to get up and walk around during your day. This may seem contradictory, but do not pee before your workout unless you really need to. People who experience bladder leaks tend to think that voiding their bladder before exercise will reduce instances of leakage, but in fact, it can do the opposite. According to Dr. O’Neill, you’re actually signaling your brain to tell the bladder to empty before it’s reached fullness, so it will need to prematurely empty more, not less. Another recommendation that might seem to go against logic is to stay hydrated before and during your workout session. The common thought is that if you drink less, you wont need to pee as much. But again, the opposite is true. Dr. O’Neill asserts that less hydration means more concentrated urine, which will actually irritate your bladder more, causing you to feel a stronger urge to urinate. Hopefully these tips will help improve the dreaded bladder leak workout situation, we know it’s definitely not the easiest thing to navigate. Luckily, when all is said and done, you don’t need to ever deal with the odor, wetness or discomfort of leaks, because there are products like Finess that stop them before they start. And thank goodness, because you really ought to be able to do your squat set without fear of wet undies. We are committed to giving women the freedom to live a life focused on doing the things they enjoy without embarrassment and fear of discomfort related to bladder leakage.